The 16-year history of the pioneering effort to build the Donald and Maureen Green Music Center at Sonoma State University has been published in a 200-page hardcover book. Now available to the general public, "For the Love of Music" is full of history from the nearly two decades-long effort to fund and build the world-class performing arts facility on the Rohnert Park campus. The book begins with the story of the project's early days, when the facility was envisioned in the mid 1990s as a replica of Seiji Ozawa Hall at Tanglewood in Lennox, Mass. Efforts by the University, Donald and Maureen Green and the Santa Rosa Symphony to bring the unique project to the community are described with accompanying personal essays by those involved. This Tanglewood tale ends with the opening of Weill Hall in 2012, as the inaugural season featured a concert by Lang Lang and a red carpet gala attended by Governor Jerry Brown, House Speaker Nancy Pelosi as well as the many supporters who had stood by the project until the final donation of $12 million by Joan and Sanford I. Weill. The book includes a history of the Santa Rosa Symphony (the resident orchestra at the Green Music Center), as well as the story of Schroeder Hall, which opened three years after Weill Hall. The idea for the book was conceived by Marne Olson, who, with her husband, SSU president Ruben Armiñana, wanted a way to thank those donors and SSU staff who had forged ahead through the up and down years it took for the project to be completed. "Their loyalty and willingness to keep the vision alive needed to be recognized for future generations to understand what it takes for community projects like this to be sustained, no matter what the obstacles," says Olson, who is currently vice chair of the Green Music Center Board of Advisors. The book project was managed by SSU Associate Vice President Susan Kashack and written primarily by Jean Wasp, former SSU marketing and communications coordinator. 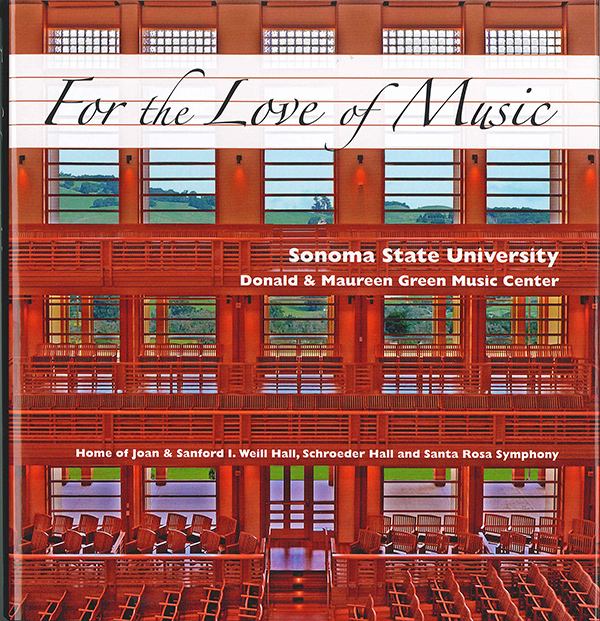 "For the Love of Music" ($39.95) is available through the Sonoma State University Bookstore at (707) 664-2329, in the lobby of Weill Hall at the Green Music Center and at Copperfield's Books. Shipping services are also available.